Welcome on the board of the Operettaship - Music Ship! „Music Show, Dinner, Ship Cruise or a cultural trip in Budapest"
Sightseeing and Dinner Cruises on the Danube in Budapest! 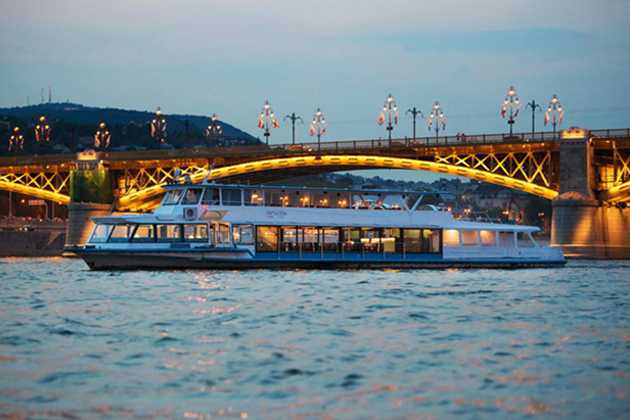 Pleasant cruises on the Danube in Budapest in combination with a wonderful dinner! You can alsoc hoose the Operetta Ship - MUSIC BOAT - Danube cruises series of events 2015th new year service. The Operetta Ship Society's international program provides guests with a highlevel of cultural entertainment that is a pleasure cruising with dinner for an unforgettable evening on the Danube, in the heart of Budapest. A memorable cruises on th eDanube, in the heart of Budapest dinner, which you should not be miss out! The Budapest cruises in company culture and unforgettable gastronomic experience in treatment to members of the public. A romantic boat trip on the Danube, Budapest dinner, which you should not miss out! We would like to invite you for one of the Operetta Ship events throughout our 16th anniversary season starting from 26th of March, 2016, every Wednesday, Friday and Sunday from 20:00 pm till 22:00 pm. According to our tradition the performer will be the ensemble of the Operetta Ship which consists professional leading and young artists from the Hungarian entertainer world and the Hungarian State Opera House. The program of the Operetta Ship is unique even in Europe. "The scenic boat- trip with delizious fooud and the wonderfully entertaining show. The best dinner cruise on the Danube. Thanks for a great time! Lasaga Family from Miami Florida U.S.A."
Europe's musical culture in one place! Give cultural experience as a gift!